Epidermis: the outermost layer of skin. It is smooth. Full-grain leather: leather complete with epidermis. It is smooth on the epidermis side and rough on the underside. For a detailed description please read “Full-grain leather“. Split: the underside leather that remains after the epidermis is removed. It is rough. Below are simple equations to assist our customers to better understand full-grain leather as the benchmark of quality for leather. 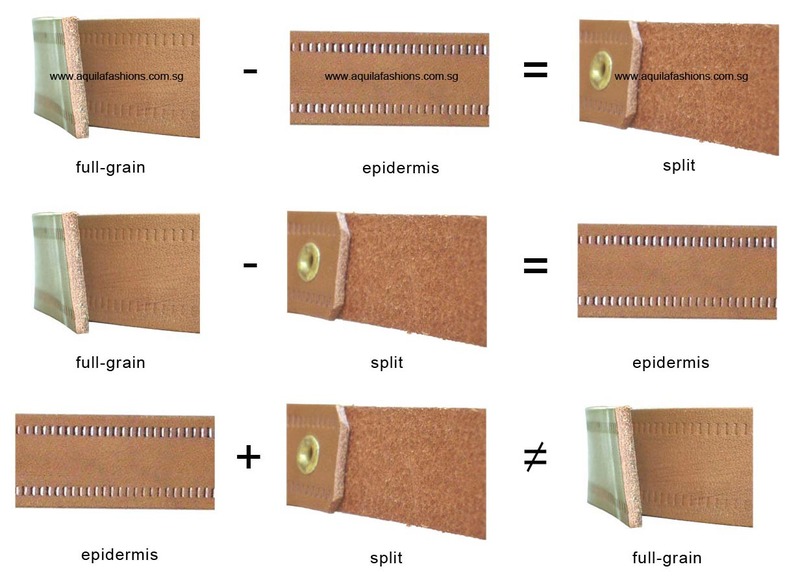 In fact, epidermis and full-grain are the same. A split cannot be reattached to the epidermis once permanently removed, as seen in the 3rd equation. It also emphasizes that while both the epidermis and the split may be genuine leather, it is the epidermis of full-grain leather that makes it the benchmark of quality in the leather industry. The split is but the less valuable by-product. Aquila Fashions uses full-grain leather. “Full-grain leather” is a technical term. The purpose of this post is to assist customers to better understand full-grain leather as being the best type of leather. “Full” refers to the intact natural state of the animal hide. Animal hide with minimal defects is used to process this full-grain leather. Sometimes, certain flaws such as scars and mosquito bites sustained by the cow are accepted. This translates into beautiful natural “designs” on the leather. Together with the undisturbed tensile strength, the marks of nature allows full-grain leather to command its position as the best type of leather. Bringing up a supposed piece of leather product to the nose for a whiff would be the most instinctive action for many. The problem with this method is that the sense of smell is subjective, hence there is no concrete basis upon which to determine whether a particular scent is that of leather or not. Leather craft involves many processes which include oiling and painting. What is perceived to be the “leather smell” is actually a combination of the scent of leather itself (which is the scent of tanning solutions), and the scents of oil and paint. That said, an imitation leather product can be passed off as one by spraying synthetic scents on it. Hot-stamp “Genuine leather” onto leather. The leather is embossed. Hot-stamp “Genuine leather” onto synthetic polymer. The polymer melts. Ink-print “Genuine leather” onto a surface. Product may or may not be genuine leather. Other tests such as the cross-section test required. Not all products hot-stamped with “Genuine leather” are made of leather. “Genuine” necessarily implies that some or all parts of a product is made of actual animal hide, therefore the purpose of this post is to assist customers to identify if a product deserves the label “Genuine leather”. “Full-grain leather” means nothing to most people as the term is highly technical. Leather on the other hand means much more, understood as a material that is durable and associated with luxury products. Customer’s appreciation stops at the concept of “leather” and does not delve into “full-grain leather”. Leather is a durable material used in shoes to prolong their lifespans. Leather is used to make luxury products. Leather has a “leather scent”. Customer able to tell full-grain leather and its near-equivalent top-grain leather apart from leather alternatives by looking at the cross section of the structure. The perimeter of a belt is usually painted. This masks the cross section. However, the customer who has basic appreciation of leather knows that edges of the holes are usually unpainted, hence exposing the cross section. Full-grain leather may or may not have defects but when present, customers with moderate appreciation of leather treat these as beauty intrinsic in nature, not as defects. Recognizing a wallet is made of full-grain leather if it sports scars from fights, barb-wires and mosquito bites. Full-grain leather may or may not have defects. The customer who has an advanced appreciation of leather recognizes that a luxurious leather product is the product of an attempt to control and make consistent the inconsistent nature. Scars and “marks of nature” are ironically unaccepted in leather products that command a premium. The front of a luxurious full-grain leather shoe cannot possibly sport a big scar running across it in the context of “natural”. Consider the difficulties of manufacturing huge leather trunks, or even sofas, with highly consistent surfaces. As the sub-heading suggests, the sophisticated customer appreciates a completed full-grain leather product from the craftsman’s point of view. He is confident and discerning, and he easily recognizes when a leather product is selling for a bargain. level 1, simply raising your appreciation one level higher gives you a lot more bargaining power as a spending consumer. level 2, they are already getting bargains. level 3, they already possess the fishing rod. It is a matter of time they progress upwards as their overall taste for consumer goods mature. 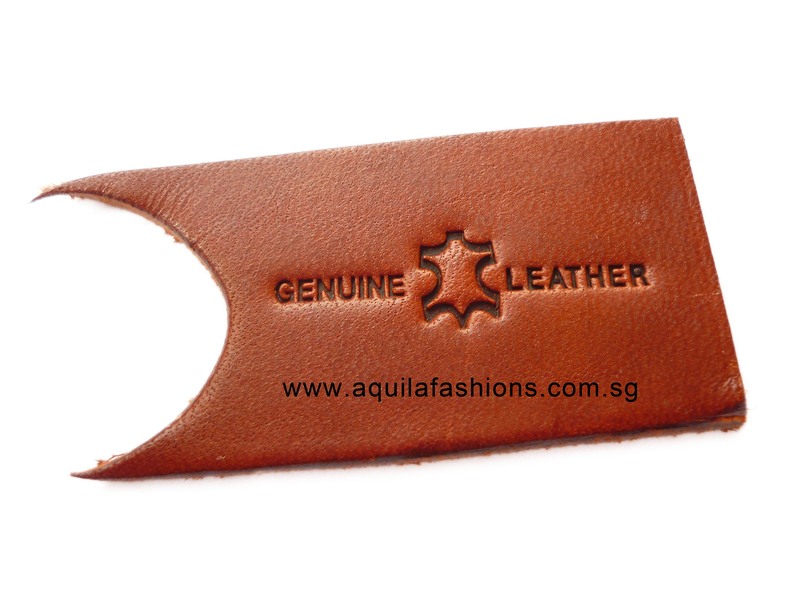 Aquila Fashions uses natural leather. A simple way to understand natural leather is in comparison with fake leather. Natural leather is made using animal hide and fake leather is made using polymers. Moving on, below is a more in-depth explanation of natural leather. “Natural leather” in itself is an oxymoron. The purpose of this post is to assist customers to better understand how the term “natural leather” comes to being, despite leather being the result of an “unnatural” industrial process called tanning. The former results in natural leather, in so far as the tanning ingredients are organic. Chemically processed leather is a recent invention to cater to mass market needs. On the other hand, the leather associated with luxury items are usually naturally tanned, a process long invented, yet the finished product so beautiful that it withstands the progress of time. A worn out leather belt strap best explains the two aspects above. A leather belt strap is functionally durable because it easily lasts for 10 years without tearing into halves. However the belt strap would cease to look desirable by then, ie the functional durability has outlasted its aesthetic durability.